This pamphlet is generously sized at 9” x 5” when closed and is laminated for long lasting durability. 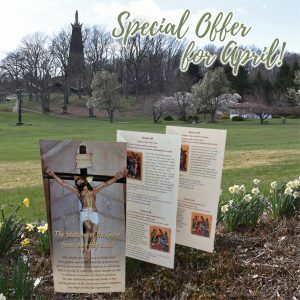 The Stations of the Cross from the Holy Land is double sided, and unfolds to reveal the Stations of the Cross and includes many prayers. The images are beautiful and even includes a picture of the Holy Sepulcher, Jerusalem. This offer is good from April 1st – 30th, or while supplies last. Free item will be added to your order at the time of shipping and will not be displayed in the shopping cart.